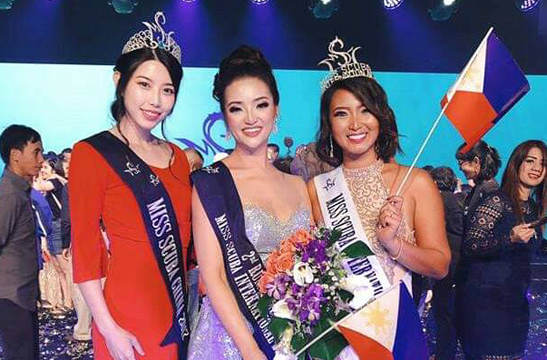 Miss Scuba Philippines Noelle Uy-Tuazon finished second runner-up at the recent Miss Scuba International 2018 pageant held in Magellan Sutera Resort, Kota Kinabalu, Malaysia participated by 21 representatives from around the world. This year's Miss Scuba Internation winners with Miss Philippines (right) joining Miss United Kingdom Daisy Whetlor's court. Crowned winner was Miss United Kingdom Daisy Whetlor, a 21-year-old advanced open water and specialty diver while Miss Chinese-Taipei Huang Yu-Wen was named first runner up. Winner of special titles were Miss Germany Joahanna Acs (Miss Photogenic), Miss Australia Zofia Marta Majka (Miss Talented), Miss Mexico Christian Anaid Salas-Martos (Miss Congeniality) and Miss Chinese-Taipei Yu-Wen (Miss National Costume). The other participating countries were Belize, China, Hong Kong, Indonesia, Iran, Japan, Latvia, Macau, Malaysia, Netherland, New Zealand, Poland, South Africa, Thailand and the United States. Tuazon, a 26-year-old licensed Professional Association of Diving Instructors (PADI) open water diver, lived in Guam as a child where she got her US citizenship. She earned a scholarship and graduated with a degree in Bachelor of Science in Anthropology minor in Geography (with a focus on biological anthropology and emphasis on Forensic Anthropology) at the Texas State University, Texas, USA. She completed extensive volunteer work at the UP-PGH College of Medicine. Tuazon first joined Miss World Philippines 2017 finishing as Top 15 semi-finalist, followed by Miss Earth Philippines 2018 in May where she was named among the Top 18. She went back to Guam in August to vie at the Miss Guam Universe 2018 pageant where she finished in the Top 5. She thought of quitting the pageants and concentrate on her profession but the Miss Scuba Philippines in October changed her plans. Miss Scuba International, now on its 8th year, is a unique pageant that focuses on marine and ocean conservation and the promotion of safe scuba diving practices. Billed “Saving Oceans through Beauty,” it was founded by Robert Lo, a strong believer in sustainable development within the realms of our marine environment. The Philippines’ Cindy Pacia Madduma brought home the crown in 2015.